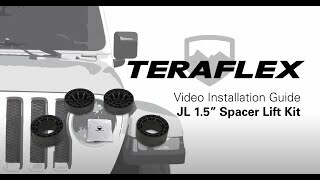 Even when reality demands that you keep your JL/JLU family friendly, TeraFlex will satisfy your primal need to go big. The TeraFlex JL 2-Door: 1.5” Performance Spacer Lift Kit allows you to run a larger tire with added clearance on the trail, all while maintaining family-friendly versatility. This kit also corrects the factory rake to give your JL Wrangler some attitude thanks to a more aggressive stance. Not only does the 1.5” Performance Spacer Lift Kit clear larger tires, but the additional height helps compensate for heavier aftermarket gear such as bumpers, a larger spare tire, or weekend swag. Works with stock length shock absorbers. Does NOT include shocks. We recommend Falcon Performance Shocks or TeraFlex 9550 VSS shocks. 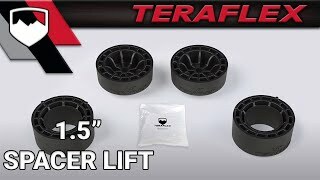 These are the only shock absorbers engineered to work with TeraFlex lift coil springs to improve both compression and rebound for optimal vehicle stability. The 1.5” Performance Spacer Lift Kit is offered without shock absorbers. Falcon Performance Shocks are available separately. • Shorter spacers in the front corrects the factory nose-up rake on JL 2-Door models. • Taller spacers in the front corrects the factory nose-down rake on JLU 4-Door models. • Rubicon Fenders require 2” front and 2” rear bump stop extensions in order to fit 35” tires. Requires 2” Front & Rear Bump Stop Strike Pad Extension Kit (# 1959500) – NOT INCLUDED. • Works w/ original or stock-length aftermarket shock absorbers – TeraFlex 9550 VSS Twin Tube Shocks (# 1545100) or Falcon Performance Shocks recommended.